So I've been with this guy for some years now, we are traditionally married. Joro every time we have a problem he runs to his mum's house, sometimes he will stay there days-weeks at a time. She never tells him to leave or try to give him advice, she lets him stay there for as long as he wants until he feels like coming back home. 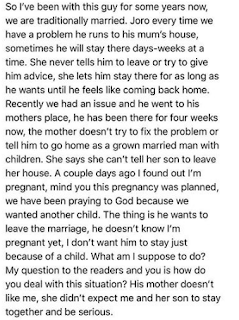 Recently we had an issue and he went to his mothers place, he has been there for four weeks now, the mother doesn't try to fix the problem or tell him to go home as a grown married man with children. She says she can't tell her son to leave her house. A couple days ago I found out I'm pregnant, mind you this pregnancy was planned, we have been praying to God because we wanted another child. 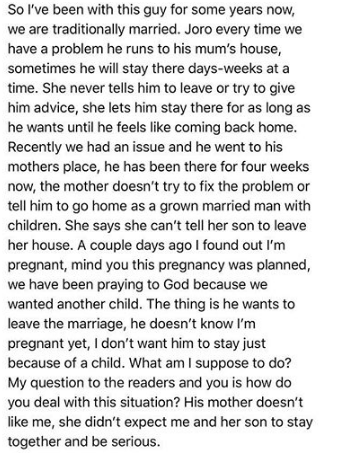 The thing is he wants to leave the marriage, he doesn't know I'm pregnant yet, I don't want him to stay just because of a child. What am I suppose to do? My question to the readers and you is how do you deal with this situation? His mother doesn't like me, she didn't expect me and her son to stay together and be serious. WANT TO TRADE CRYPTO? THEN READ THIS!